There are few things that scare me in the kitchen: breaking down and cooking fish, dull knives, and taking a water bath out of the oven. On more than one terribly unfortunate occasion, I have spilled hot, hot, HOT water all over the floor and splashed it all over my legs. Yes, simmering hot water all over my legs. I’m just super thankful that I have never been badly burned. 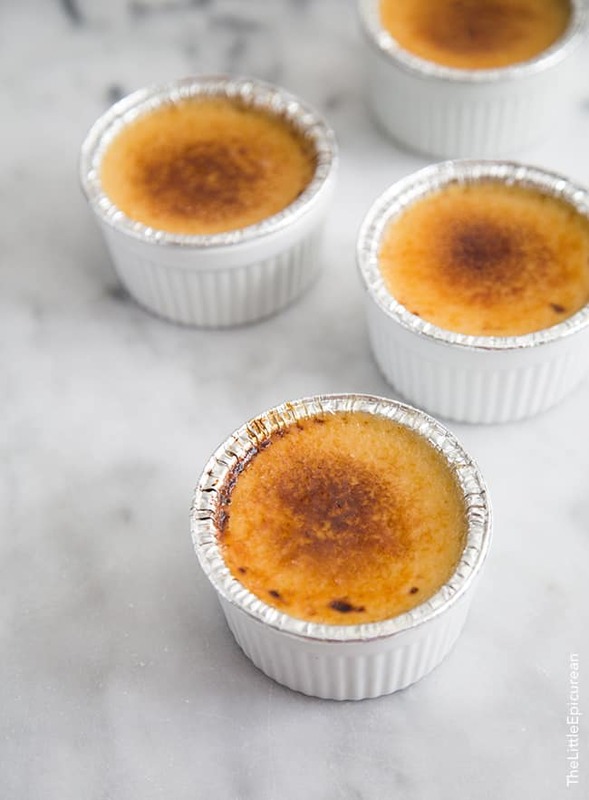 For the longest time, I hated making crème brûlée–simply because I did not like removing the crème brûlée ramekins and water bath out of the oven. Custards and other egg based desserts need to be cooked “low and slow” to prevent that unwanted eggy-taste. Don’t try to cook crème brûlée without a water bath. The custard needs to be gently heated so it doesn’t turn into a rubbery, jello mess, which is the case when it is overcooked. Well, I’m happy to share with you my water bath alternative- the slow cooker! YES, a slow cooker set on low heat turns into the ideal water bath for crème brûlée. Traditionally, crème brûlée consists of heavy cream, egg yolks, sugar and vanilla. I lightened this version a tad with the use of whole milk. Feel free to use all cream. You will end up with a creamier and silkier treat. Instead of vanilla, I’ve infused my crème brûlée with tea! My friends at TeaGschwendner sent me a couple bags of my favorite teas. All summer I’ve been sipping on cold brew Caipirinha tea. But lately, I’ve been having a change of heart. Have you noticed all the cute sweaters and fall colors making their way into fashion magazines and shopping malls? I couldn’t help myself. I started a bit early with the fall flavors in the kitchen. I used TeaGschwendner’s Cinnamon Stars to make this tea-infused crème brûlée. Cinnamon Stars (made with Rooibos tea and honeybush tea) works wonderfully for desserts because it smells and taste like freshly baked cinnamon rolls wrapped in vanilla beans. You can experiment with any of your favorite teas: earl grey, chai, peppermint. Any kind of tea or spice can be infused into cream. Simply bring cream to a simmer and add tea (loose or bag). Cover the pot and let tea steep until desired flavor is achieved. Every restaurant I’ve ever worked at has some sort of crème brûlée or custard/pot de crème on the their dessert menu. It is by far the easiest and cheapest dessert to make. And the best part, it can be made ahead of time in large batches. Back in culinary school, crème brûlée was dubbed the “perfect” dessert because of its contrasting flavors and textures. Sweet silky custard encased by a slightly bitter burnt sugar crust. I like contrast. It keeps things interesting. 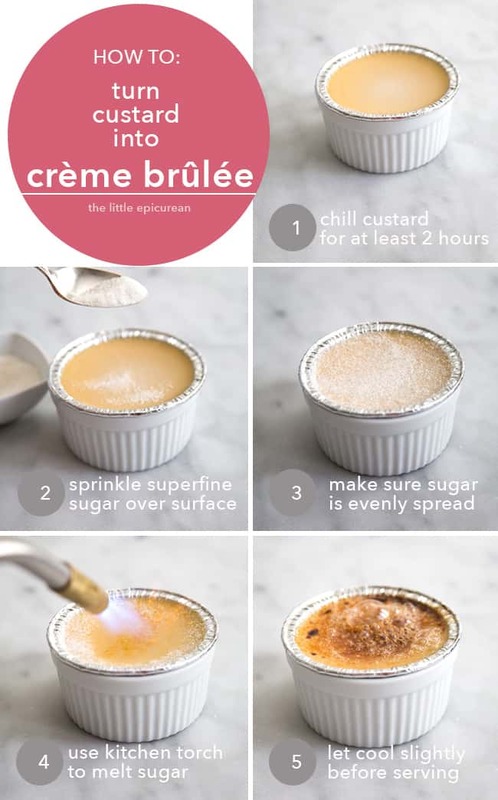 Crème brûlée is a dessert everyone should know how to make. It requires little ingredients and can be easily made in a slow cooker! Make it even more special by infusing tea into the custard. Place cream and milk in a medium sauce pot. Set over medium heat and bring to a boil. Remove from heat and add tea leaves. Cover and allow to steep for 15-20 minutes. Strain out tea and discard. Let tea-infused cream cool slightly. Transfer to a medium bowl. Add egg yolks, salt, and granulated sugar. Whisk until sugar has dissolved. Add about 1 1/2 cups of water to slow cooker. Place four 6-oz ramekins (or disposable aluminum foil ramekin cups) in slow cooker. Fill cups with custard mixture. Make sure that the ramekins are at least half submerged in water. If necessary, add more water in the bath. Cover slow cooker with lid. Set to cook on low heat for 2-3 hours until custard has set and registers 185 degrees F on a food safe thermometer. Carefully remove ramekins from slow cooker water bath. Let sit at room temperature for about 10 minutes to cool. Then place in the fridge uncovered to cool, about 60-75 minutes. Once custard has completely cooled, cover with plastic wrap. When ready to serve, remove chilled custard from the fridge. Let sit at room temperature for 15 minutes. Sprinkle about 1 tsp of superfine sugar over custard. Gently rotate ramekin around to ensure sugar is evenly distributed. Using a kitchen torch, melt and caramelize the sugar until a nice golden crust has formed. Let sugar cool slightly before serving. Cooked and chilled custards can be kept in the fridge for up to 4 days. Superfine sugar (also called baker's sugar) can be made by pulsing granulated sugar in a food processor. Note: I use this industrial propane torch with an attached trigger start. (You can easily find it at hardware stores.) It’s kind of big and dangerous, but that’s what I’m used to. It’s great for large scale production or heavy use. However for more infrequent use, I recommend this safer compact kitchen torch. Brilliant idea with the slow cooker! I don’t have to heat up the house with the oven, especially in August. I’m going to make this for my friend who gave Alex a Creme Brulee Kit about 10 years ago. Unfortunately, he never made any for her or for us. He just played with the kitchen torch. Sad, I know. But now I can make them myself. Yaay! Thanks Mrs. B! The slow cooker makes creme brulee so much easier! Alex says he remembers that kitchen torch. He used it to make caramelized bananas. 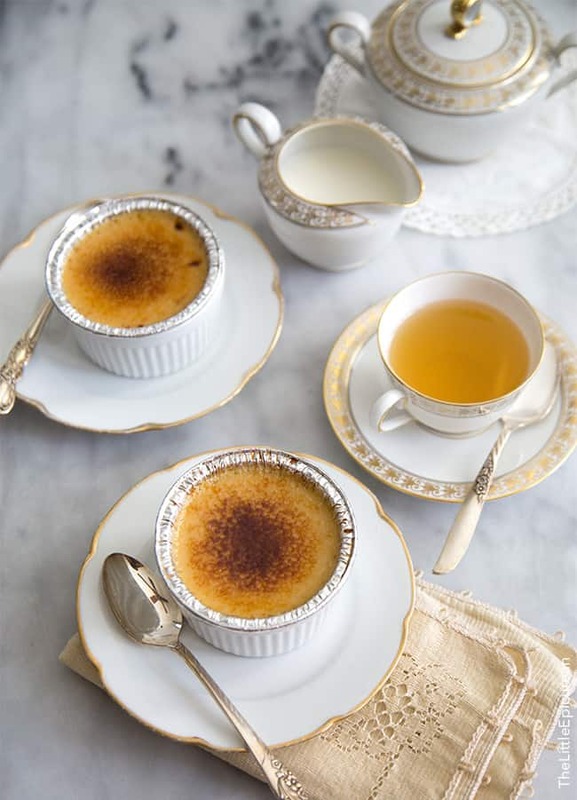 Never would have thought to make creme brulee in a slow cooker but seems like a great idea! Thanks Millie! I’m trying to find more ways to use up my slow cooker so I don’t have to turn on the oven and make the house hot! I am definitely going to try to make it at home! Plus I have Tea Gschwendner just around the corner from my house! Thank you for sharing! Thanks Monika! Lucky you! When I used to live in Chicago, I used to visit the store two blocks from my apartment! 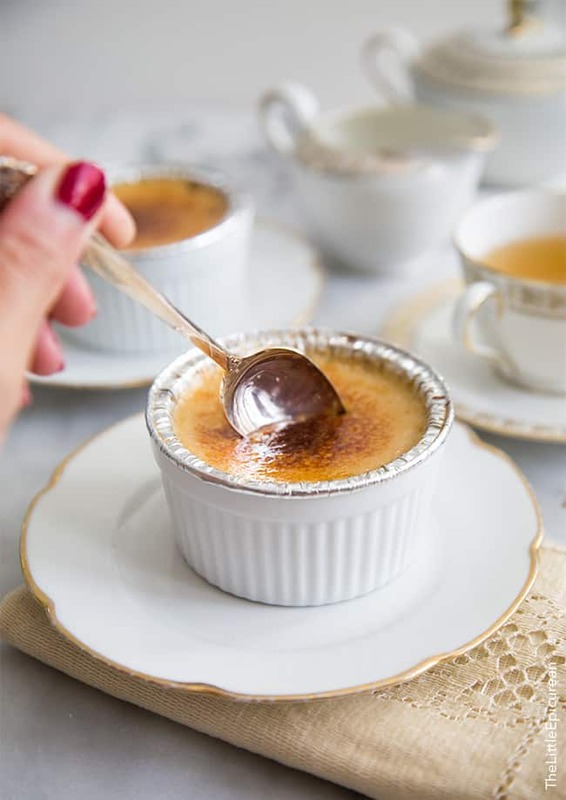 I have never made crème brulee before but this Slow Cooker Creme Brulee looks easy and delicious. Pinned! Gosh these look so gorgeous. 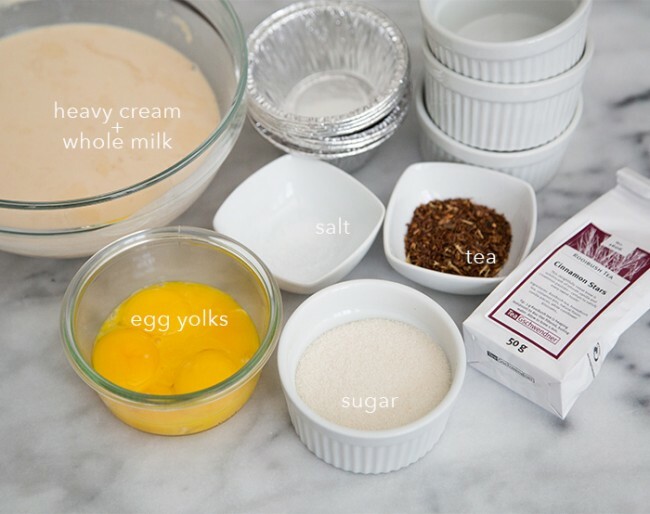 I have been wanting try to make creme brulee for some time now! Thanks for the inspiration! Wow I have to recreate this recipe.. genius idea using a slow cooker! These creme brulee’s look delicious and I am totally loving your cute presentation. Pinned! 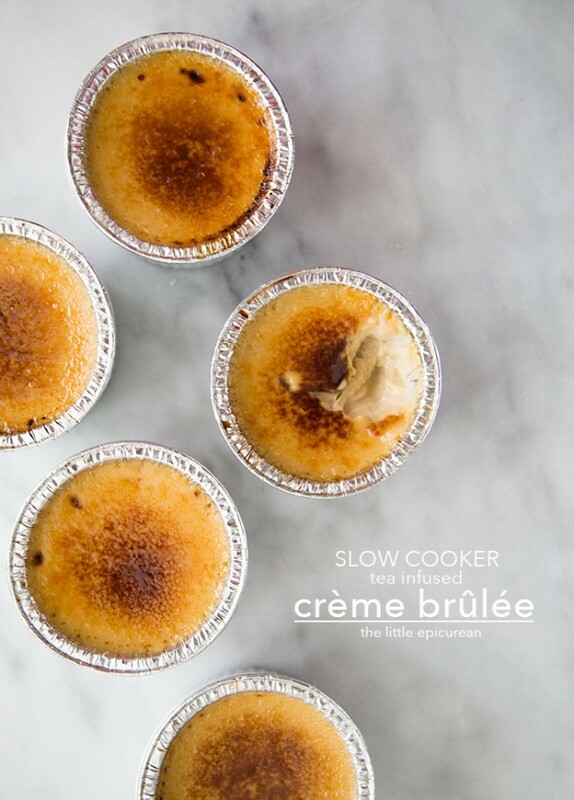 There’s a such thing as slow cooker creme brulee??? Less effort??? I’m all in!!! If it’s in the slow cooker, doesn’t that mean it might be ready during breakfast time? Creme brulee for breakfast!!! !